While the report is meant to spur discussion ahead of the WHS, it is also a call to action. One Humanity calls upon the international community to embrace five “responsibilities”: to provide political leadership to prevent and end conflicts; to uphold humanitarian laws and norms; to leave no groups behind in humanitarian action; to transition from a system based on delivering aid to one based on ending need; and to provide greater financial investment. The fourth of these is arguably the most direct appeal to humanitarian agencies to move beyond the status quo and embrace a new modus operandi. One Humanity calls for a transition from short-term, fragmented approaches at the peak of crises towards pursuing “collective outcomes” that increase the self-reliance of affected communities over the long-term. This invariably requires bridging longstanding divides between humanitarian and development organizations; reinforcing, rather than replacing, national and local systems; and providing predictable, multi-year financing. This tone is not dissimilar to that infusing the negotiations over the SDGs, which sought to achieve greater integration of development aid under the banner of 17 distinct goals. Critics have called the report ambitious in asking member states and partners to implement some 120 recommendations while lacking in clear expected outcomes. Others claim it doesn’t go far enough, falling short of demanding internal reform of the UN-led humanitarian system crystallized in General Assembly Resolution 46/182 that might empower the organization. Various stakeholders have voiced concerns reflecting their specific priorities. For instance, the UK medical journal the Lancet argued that health concerns, such as the prevalence of non-communicable diseases in conflict-affected populations, should have been acknowledged. These criticisms may be surprising given that the Secretary-General, in striving to make the WHS process as inclusive as possible, launched a series of consultations over a three-year period to collect the views of some 23,000 participants across 151 countries. Many of these diverse perspectives were in fact incorporated into the report. Yet as Alice Obrecht, a Research Fellow at ALNAP, observes, this may be why the report lacks coherence at times: in trying to offer something for everyone, it essentially reproduces—rather than resolves—longstanding tensions over competing humanitarian visions. At the heart of these tensions are disagreements over the appropriate role of development aid in the humanitarian space. The UN and others have seized upon the concept of “risk and resilience” as a bridge between humanitarian and development work, arguing for increased development aid to help communities in crisis prepare for risk and face down shocks. However, organizations like Médecins Sans Frontières have argued that the resilience concept undermines the integrity of core humanitarian principles by drawing attention away from short-term, acute needs of suffering populations. This debate is further complicated by a changing humanitarian landscape that is more splintered than ever before. Once the domain of multilateral organizations and government agencies, aid delivery is now crowded with new actors such as civil society, faith-based organizations, the military, and the private sector. This proliferation has resulted in divergent methods, approaches, and opinions concerning the most effective ways to reduce human suffering. The WHS may provide an important opportunity to hash out these differences and focus the range of current thinking and approaches. Crucially, it presents an opportunity for the UN to re-assert itself as a leader in humanitarian aid. One Humanity calls upon humanitarian NGOs to commit to “consolidation of efforts” and for international aid organizations to operate “under one leadership.” How can the UN achieve this level of integration and unite a fragmented humanitarian system? Putting current UN reform processes aside for a moment, history has shown that several high-profile interventions led by UN chiefs have resulted in tangible reforms across key sectors. It may be possible to draw lessons from these successful endeavors. 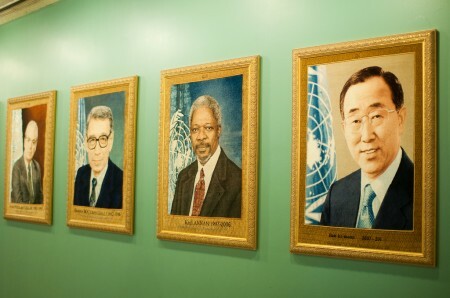 First, the secretary-general’s office has in the past served as an incubator for generating new ideas. For instance, Agenda for Peace and its 1995 supplement critically shaped the conduct of UN peacebuilding and peacekeeping during the pivotal post-Cold War period. Among other innovations, the report conceived of the concept of post-conflict peacebuilding as action “to strengthen and solidify peace in order to avoid a relapse into conflict.” It also inspired the creation of the UN Peacebuilding Commission a decade later, and it continues to inform contemporary UN reform processes. Second, as argued by UN scholar Ian Johnstone, the Secretary-General can use his “bully pulpit” to push for normative change even when consensus may appear elusive. For instance, former UN Secretary-General Kofi Annan repeatedly advocated for adoption of the norm of responsibility to protect, or R2P, after it was conceived by a Canadian-backed commission in 2001. At a time when interest in R2P was uncertain, Annan commissioned the 2004 High-Level Panel on Threats, Challenges, and Change, followed by his 2005 report In Larger Freedom. These efforts helped generate political traction for R2P, setting the stage for its eventual endorsement by over 190 member states during the 2005 World Summit. Third, some proposals may land quietly but can have long-lasting effects. Boutros-Ghali’s 1996 report Agenda for Democratization made the case for greater UN involvement in democracy promotion by linking democracy to peace, development, and human rights. Overshadowed by other events, the report was released into relative obscurity and, in fact, almost didn’t make it to print. Yet decades later, this document is regarded by UN scholar Simon Rushton and others as laying the foundation for the UN’s extensive democracy promotion activities, such as the promotion of free and fair elections. Its echoes can even be found in the 2030 SDGs. Of course, there are big differences in content and context between the above examples and the WHS. For instance, the 2005 World Summit was an intergovernmental gathering with legal and diplomatic force; the WHS has been called essentially a big conversation among member states, humanitarian organizations, civil society, the private sector, and affected communities that currently lacks clear outcomes or commitments. Nevertheless, what these past initiatives have in common is focused leadership—along with some grit and ingenuity—from the UN’s top office. Stronger action for institutional and normative change, including laying down clear goals and outcomes and displaying a willingness to test out new mandates and practices—even in the absence of stakeholder consensus—might help to dispel the perception in some corners that Ban is a lightweight when it comes to seriously tackling humanitarian system reform. So, with the summit only two months away, it may be time for him to use the bully pulpit. Michael R. Snyder is an independent analyst and regular contributor to the IPI Global Observatory.